Marvel Studios has just announced Marvel’s “Guardians of the Galaxy”: An IMAX® 3D First Look", featuring 17 minutes of exclusive footage from the highly anticipated summer blockbuster “Guardians of the Galaxy.” The sneak peek will be showcased in 150 IMAX® theatre locations across North America on July 7 at 7 p.m. Select IMAX 3D® theatres nationwide and internationally will offer a FREE special screening of thrilling, never-before-seen IMAX 3D footage of the James Gunn-directed epic space adventure, which opens in U.S. theatres on August 1. 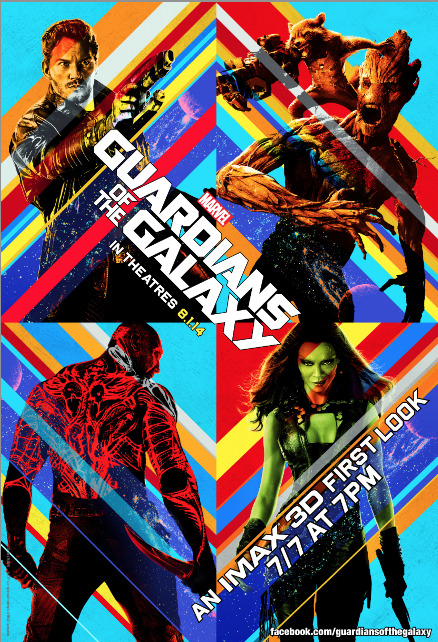 Fans who attend this sneak peek will also receive a FREE limited-edition collectible Marvel’s “Guardians of the Galaxy” IMAX poster. Kevin Feige, p.g.a., is the producer and Louis D’Esposito, Alan Fine, Victoria Alonso, Jeremy Latcham, Nik Korda and Stan Lee serve as executive producers. James Gunn and Nicole Perlman wrote the screenplay.